In the last 1.5 years I've managed to get traffic at kkava.com from 83 countries. 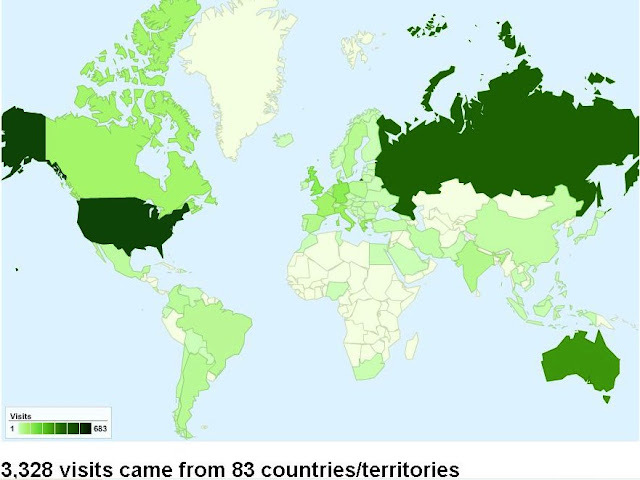 Interesting that Russia and the US are the two biggest sources. Most of this traffic comes from a music video my friend Aaron Jones made with SpringThing. An Australian ad guy asked me to adapt the code for a dance troup exhibition but was unimpressed enough to use a different concept. Ah. I needed Aaron. I know. Not the refined aquarist's choice. But man, the contrast between this guy and the plants and sandstone is unbeatable. We took a bus and walked from Surry Hills through downtown. There are some amazing tiny old pancake homes nestled in there. This Cafe is on the corner of a busy intersection, but really nice still. 'Cept the chairs. Scabies revolutionary. I love this embossed font. I want it on my Website. In case you want to see a drive through Sydney is high speed (more to come).